Mrs. Willie B. Washington Bacon, age 88 of Pembroke, Ga., passed on Sunday morning March 31st at her residence with her family by her side, under the care of Bethany Hospice and Palliative Care of Claxton, Ga. She was an Effingham County native but resided in Bryan County for many years. 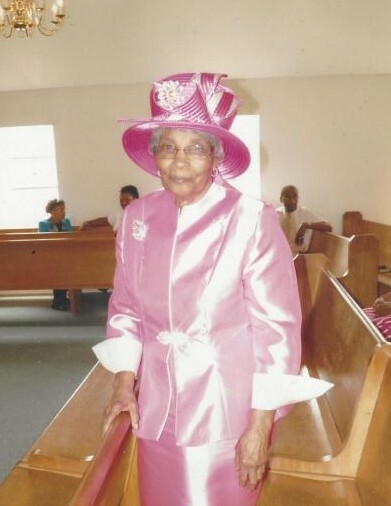 She was a faithful and longtime member of the Jerusalem Missionary Baptist Church in Groveland, Ga., where she served on the Ushers Ministry, the Kitchen Ministry and anywhere she was needed. She retired from the Bryan County Board of Education in Food Services. She is survived by her loving daughters Mrs. Annette Newton, Mrs. Sharon Geiger, Mrs. Ernestine (Jenkins) Chapman, and Mrs. Beverly (Charles) Johnson all of Pembroke, Ga., and Mrs. Linda Motley of Prattville, Alabama; her loving sons Mr. Alfonso Bacon of Pembroke, Ga., Mr. Odell (Sarah) Bacon of Americus, Ga., Mr. Kenneth Bacon, Jr. of Statesboro, Ga., Mr. Donnell Bacon of Milledgeville, Ga., and Mr. Darien (Cheryl) Bacon of Bloomingdale, Ga.; a loving sister Mrs. Viola Price of Riverdale, Ga.; and a host of other relatives and friends. Family and friends visitations will be held Friday April 5, 2019 from 6-7pm in the chapel of Craig R. Tremble Funeral Home, Pembroke Chapel. Home Going Celebration for Mrs. Willie B. Bacon will be Saturday April 6, 2019 at 1pm at the Jerusalem Missionary Baptist Church, Groveland, Ga., with the Rev. Victor Brewton, Officiating/Pastor. Interment will be held in Church Cemetery. Mrs. Willie B. Bacon will lie-in-state from 12pm until funeral hour. There will be no viewing after eulogy.